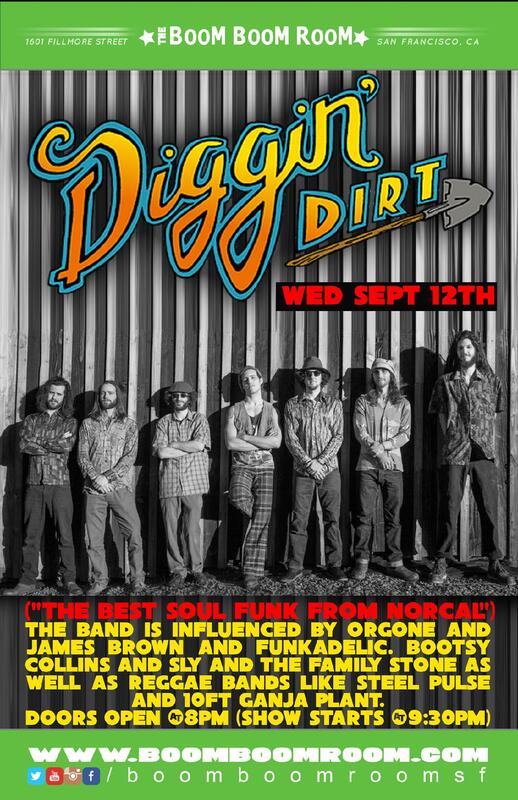 Diggin Dirt began planting its roots back in 2011 in the town of Arcata, CA in Humboldt County. The newly conglomerated 8-piece band had instant chemistry, and after only a few months of playing together, released their Full Season LP. Their debut album is comprised of 11 tracks that showcase musical influences ranging from afrobeat, reggae to rock, but always with an underlying theme of funky soul. The band began touring throughout California and Oregon, and was met with a tremendous response. A reputation of quality original music backed by high energy performance grew around the Dirt’s name, and in turn inspired them to keep growing. A byproduct of this growth is the recently released Bedrock EP. Showing more musical maturity and a new depth of identity, the album is a true sign of more to come. The Dirt is more inspired than ever, and ready to bring the music to the people. With more expansive West Coast tour dates, and fresh material coming out of their preparations, the group shows no signs of slowing down as they expand their reach. Earn that paycheck, and dust off those dancing shoes because we’re looking at you tonight! Electromagnetism is what holds everything together. It’s also Lil’ Elephant’s debut EP, released April 2018 to a full house of local fans and friends. Electromagnetism was produced in Berkeley at Outland Studios by Nick Stein. The songs are a story of power - power of freedom, power in introspective understanding, power of decision making, and eventually the loss and transformation of power. It draws influence from the soul music of motown, the progressive sound of the mars volta, the blues, and the wicked harmony found in early cathedrals. The band began touring in the spring of 2017 throughout California and Oregon, and was met with a tremendous response. A reputation of quality original music backed by high energy performance grew around the Dirt’s name, and in turn inspired them to keep growing. A byproduct of this growth is the recently released Bedrock EP. Showing more musical maturity and a new depth of identity, the album is a true sign of more to come.